Dragon Quest IX's release dates in the U.S. and Europe have been confirmed, so all that's left now is to wait for the JRPG goodness. Nintendo and Square Enix have set official release dates for the Nintendo DS's Dragon Quest IX: Sentinels of the Starry Skies in both the U.S. and Europe. The game will be released in the U.S. on July 11, while Europe will see it on July 23. The companies are hoping the game will light the two markets on fire just as it did in Japan, selling over 2 million copies in two days. Dragon Quest is an insanely popular RPG series in Japan, but hasn't had even close to the same measure of success anywhere else. The problem with drawing in non-Japanese consumers could be related to Dragon Quest's simple visuals, especially when compared with the more recent Final Fantasy titles which are very popular in the U.S. and Europe. Dragon Quest IX stays the course in regards to graphics and general style, but adds a notable multiplayer mode and gives players the ability to create their own characters. 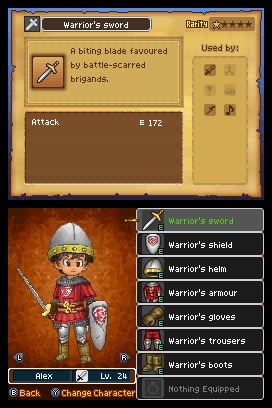 Rather than being stuck with one type of character for the entire game, Dragon Quest IX allows anytime class changes and provides more than 1,000 different pieces of armor and weaponry that will each alter a character's appearance. Four players can experience the game though a local wireless multiplayer mode, with an additional "Tag Mode" that will communicate with other DS systems running Dragon Quest IX while in sleep mode. Replay value is added through a quest system, with downloadable quests to be made available that may even continue the game's main storyline. Nintendo has said it wanted to give a big push to Dragon Quest IX outside of Japan, but I personally haven't really seen this yet. Now that the game has a confirmed release date, maybe we'll be inundated with Dragon Quest IX everywhere we look in the coming month-and-a-half.